class="post-template-default single single-post postid-333600 single-format-standard custom-background group-blog header-image full-width singular wpb-js-composer js-comp-ver-5.7 vc_responsive"
BEIJING (Reuters) – China reported four cases of African swine fever on Thursday alone, bringing the number of outbreaks to 13 since the virus was discovered in the country just over a month ago. The agriculture ministry said it had identified the disease on three small farms in Jiamusi in Heilongjiang province in China’s northeast and the cities of Wuhu and Xuancheng in the eastern province of Anhui. The largest of the three farms had 203 pigs, while the smallest had only 30 pigs. Earlier on Thursday the ministry had reported a case in the city of Chuzhou in Anhui, on a farm which had over 800 pigs. The disease killed 22 of them, while another 62 were infected. The new outbreaks bring the number discovered since Sunday to eight, stirring worry about the increasing speed of infection around the country. All of the new cases were in cities already infected, or in the case of Chuzhou, relatively close to earlier outbreaks. 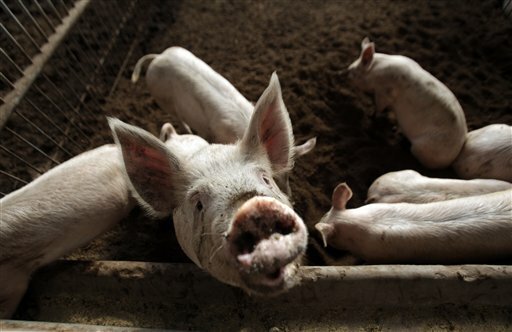 The disease has traveled vast distances in the world’s largest pork producer from Jiamusi, Heilongjiang, on the border with Russia to Wenzhou, in Zhejiang province, which is 3,000 km (1,865 miles) to the south. Efforts to control the rapid spread of the disease by banning transport of live hogs from and through infected areas has left traders idle, farm pens bursting with pigs, and slaughterhouses short of stock. The outbreaks have pushed up pork prices in the country’s south as demand grows ahead of a week-long holiday in October and also raised the prospect of more imports. While most of the cases have been discovered on smallholder farms, the infected farm in Chuzhou was relatively big, underscoring the risk to some of the huge, modern farms that have opened in China in recent years. Experts say backyard farms are typically more vulnerable to infection as they have lower biosecurity measures in place. Swine fever is transmitted by ticks and direct contact between animals, and can also travel via contaminated food, animal feed, and people traveling from one place to another. There is no vaccine. It is not harmful to humans.